Post ISD will not have school on Friday, April 19, 2019 (Good Friday) or on Monday, April 22, 2019 (bad weather day). Classes will resume on Tuesday, April 23, 2019. Have a wonderful Easter weekend! 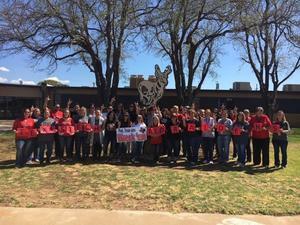 POST ISD SUPPORTS TEXAS TECH RED RAIDERS! Post ISD sported Texas Tech shirts on Monday, April 8, 2019 to support the Texas Tech Men's basketball team in the 2019 National Championship against Virginia. WRECK 'EM, TECH! Post High School won the UIL Academic Meet hosted at Post High School on Wednesday, March 27, 2019. This makes the third year in a row that PHS has been the district academic champion for UIL academics. Congratulations to all students, academic coaches, and administrators on a great win! 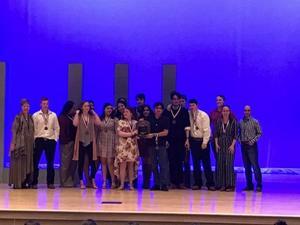 POST HIGH SCHOOL OAP ADVANCES TO BI-DISTRICT COMPETITION! The Post High School one act play, "The Diviners", advanced to bi-district competition after yesterday's performance at the district competition. The play was amazing and the cast and crew did a phenomenal job! Receiving individual honors were: Elizabeth Pevey-all star technical crew, Shayla Brown-honorable mention all star cast, Roger Esparza-all star cast, and Rico Cisneros-overall all district best actor! Congratulations to the cast and crew, along with directors, Cathy Sawyer and Ricky Abraham. Spring break begins early this year with NO SCHOOL tomorrow for Post ISD students. Please have a safe and restful spring break. We will see you on Monday, March 18, 2019! The term of a person's refusal of entry to or ejection from the District's property may not exceed two years. On Wednesday, August 15, 2018, the Texas Education Agency (TEA) released the district ratings for school districts across the state of Texas. The standard of measurement used to calculate these ratings was solely established by TEA without input from stakeholders, such as students, parents, teachers, or community members. Post ISD received a "C" rating for its district accountability rating, per the formula established by TEA. We, at Post ISD, pride ourselves in providing our students with a well-rounded education; therefore, we wanted you to know the achievements we have experienced at Post ISD during the 2017-2018 school year. Here is the "rest of the story" (click on the heading entitled "Post ISD Statement Concerning TEA's A-F Accountability Rating and it will bring up a word document. When you click on the document, you will see numerous accomplishments experienced by our students during the 2017-2018 school year). Post ISD Board of Trustees adopted the 2018-2019 school calendar on February 8, 2018. The Post ISD Board of Trustees passed a resolution supporting the pursuit of district of innovation status for Post ISD on Thursday, March 9, 2017. The Board also held a public hearing and appointed a district of innovation committee to develop a district of innovation plan for the 2017-2018 school year and beyond. There will be a public meeting concerning the district of innovation plan on March 20, 2017 at 3:45 p.m. in Post ISD's central administration office. The plan that was developed is attached below.